For the upcoming decade the legendary stadium in Marseille will be called Orange Vélodrome. While official value of the deal wasn’t revealed, estimates put it quite low. Ironic, isn’t it? Announcement of naming rights deal between Arema (company operating the stadium) and telecom giant Orange comes just before Euro 2016, when the name won’t be used for legal reasons. Still, this is the time when French stadiums get more attention than ever, so the name Orange Vélodrome already received quite some exposition. As Arema announced, they’ve reached a 10-year long agreement with Orange, securing the first naming rights deal in the famous stadium’s history. 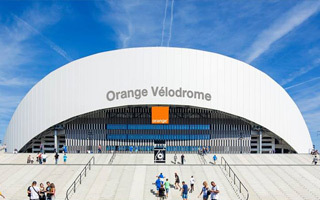 France’s second largest football venue will be named Orange Vélodrome, though the below image of possible branding is clearly not final. Since it’s a stadium of great importance in French sport, supported by the strong brand of Olympique, it was anticipated that a contract might prove lucrative. But the search for proper partner lasted much longer than anticipated with dozens of companies ending negotiations. Eventually Orange, the brand first rumoured to get the deal in 2013, proved the best sponsor. However current estimates put the deal’s value at just 50% of what was expected three years ago. €3 million per annum over one decade isn’t much, though the French naming rights market is a new one with many modern venues seeking partners. Aside from the marketing value for Orange, the deal will also see changes for matchgoers. Olympique supporters will receive greatly improved internet access throughout the stadium. 1,000 wifi terminals will allow up to 20,000 people to use high-speed internet simultaneously. The changes will, of course, be implemented after Euro 2016, when the contract officially goes into force.